Texas lives off low-wage workers but does little to help them escape poverty. Marion Patton makes $9 an hour working at Braum’s in Fort Worth. She’s waiting (and hoping) to get full-time work at the ice cream and burger joint. Photo by Jordan Ricaurte. Her eyes are aquamarine, piercing but kind. Like the color of the sea before it washes up onto the beach. Those eyes have seen homelessness, heartache, and the daily needs of three little people who call her Mommy. She wishes her toes were squishing the cool white sand like they did so many times before she left Pensacola, Fla.
Schmelzle spent six months at Presbyterian Night Shelter near downtown with her kids before she was able to get a job waiting tables at Denny’s. 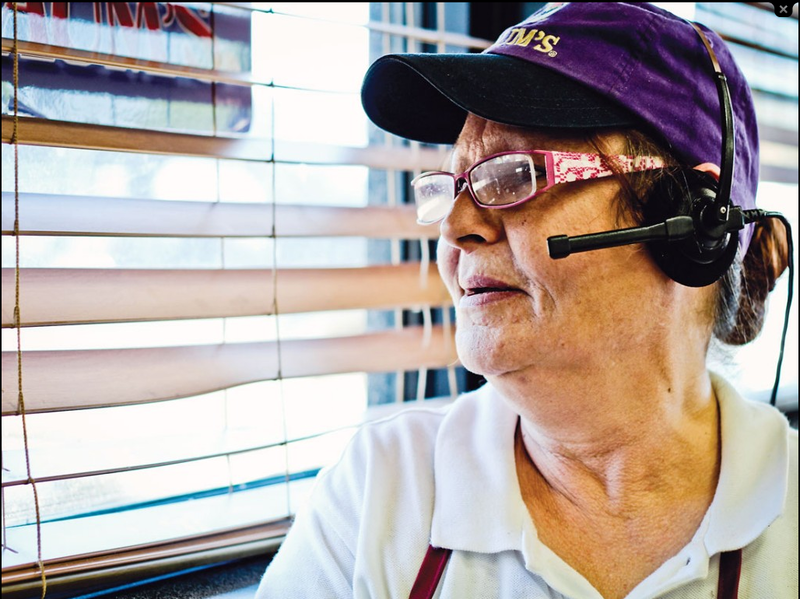 Today, we’re sitting at a booth inside the restaurant after her shift (8 a.m. to 3 p.m. five days a week). She got off early, and the restaurant is almost empty. I ask for a glass of tea and immediately feel guilty. She’s worked hard enough already. Schmelzle, 32, makes about $950 a month. That’s with tips and the $2.13 hourly wage for tipped employees. The tipped employee wage, according to federal law, must equal at least $7.25 an hour when tips and $2.13 are combined. But that income isn’t nearly enough to pay for her unsubsidized apartment or for licensed childcare for her 4-year-old son. Luckily, her other two children, ages 13 and 8, are already in school. She couldn’t qualify for the county’s childcare assistance program, Child Care Management Services, until she got a job. But she couldn’t work until she had someone to watch her kids. And even with her Denny’s position, she will never make enough to be self-sufficient. It’s the kind of vicious cycle that keeps minimum-wage workers perpetually on the financial edge. Low-wage workers across the country — particularly women — face these problems every day. But in Texas, there’s no end in sight.